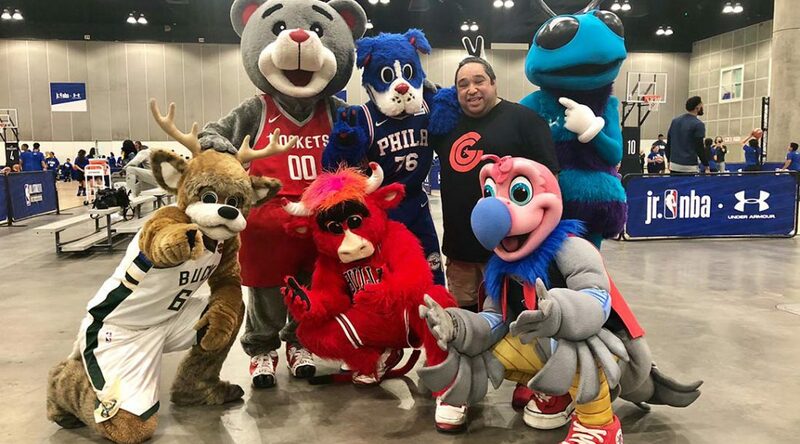 The NBA invited Davila to lead mascots at his fifth All-Star Weekend, where his duties have included producing rehearsals, getting mascots to events on time, keeping them from being tackled by fans and hydrating the humans behind the masks. Despite the logistical aspects of his role, Davila said his most important job this weekend is to let the mascots showcase their creativity and be themselves. A background in marketing led Davila to his role with the Rockets, where his day-to-day duties are a bit more comprehensive than they are this weekend. In addition to game-day preparation such as building, cleaning and repairing props, Davila helps generate skit ideas for social media videos and is the year-round contact person for booking the Rockets’ mascot, Clutch. Davila’s duties are not limited to behind-the-scenes work, however. At every Houston home game, he serves as a sidekick to Clutch during in-game performances. Davila said he has not had to discipline any mascots this weekend or been involved in any serious issues before, but did mention a Houston mascot mishap that took place before he was employed with the organization. “Years before I was on board, Clutch shot Cuttino Mobley with a T-shirt cannon,” he said.